It all started in 1990, when a South African engineering company tendered for a World Health Organisation (WHO) project. The tender asked for the development and production of solar-powered medical vaccination refrigerators, and National Luna answered the call. R3 million investment that was required for the development of the prototype refrigeration unit is the equivalent of R10 million today. 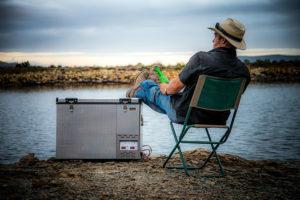 it started marketing its 12 V portable fridges to the outdoor travel industry, targeting any and all hobbyists who combined motor vehicles with an outdoor way of life. This included fishermen, hunters, caravanners and safari lodge owners (for game-viewing vehicles). Surprisingly, the recreational 4×4 market had yet to take root in South Africa; in fact, it wasn’t until the mid-1990s that the off-road travel industry sprung to life. As the number of 4×4 enthusiasts in South Africa grew, so did the demand for National Luna fridges, which were rapidly evolving to meet the requirements of overland travelers, campers and tour operators. This led to the 1998 launch of an entire range of dedicated fridges for the off-road travel market. Gauteng employs more than 70 workers, and while sections of the factory are fully automated, the actual assembly work is done by hand. Although National Luna can lay claim to many “first-ever” titles within the portable fridge game, it’s best known for its 2002 release of a dual-compartment fridge, and more specifically, that the temperatures of these two compartments could be controlled individually, one as a fridge and the other a freezer. What made this feature even more remarkable is that National Luna managed to do this using only one compressor and a sophisticated electronic control unit, resulting in significant space, weight and cost savings. company was so precise that they also copied a spelling mistake, written in tiny text, along the length of a wire. This served as a sobering reminder that National Luna needed to remain ahead of the competition at all times, to be the leading brand that perpetually innovates, pioneers, and proudly manufacturers the only commercial camping fridge in Africa for harsh African conditions. TWENTY FOUR YEARS OF EXCELLENCE. The first National Luna fridge ever made, and the same unit presented to the World Health Organisation. This fridge is now 24 years old and still going strong! National Luna was the first to launch dual-controls and double-bin technology in the 12 V camping fridge market. It was also the first to introduce a digital control panel. Previous Previous post: Watter Battery Is Die Beste?